US President Barack Obama's administration is facing new questions over the attack on the US consulate in Libya, amid reports of military preparations to target those behind it. 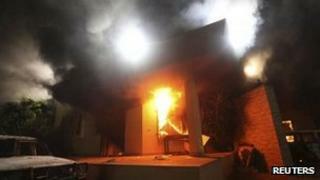 A Congressional committee asked whether repeated requests for more security at the Benghazi consulate were rejected. The US ambassador was among four Americans killed on 11 September. The US is gathering intelligence ahead of a possible military operation against those implicated, US media say. Ambassador Christopher Stevens, another diplomat, Sean Smith, and two security personnel died in the attack, which came in the wake of protests over a US-made amateur video that mocked the Prophet Muhammad. However, many unanswered questions remain about the killings. The US government conceded last week that "some of those involved were linked to groups affiliated with, or sympathetic to al-Qaeda". The handling of the situation has become a key issue ahead of the US presidential election. Republicans have repeatedly criticised the Obama administration for laying the blame on the film when evidence pointed to a deliberate terrorist attack. Two key figures on the House of Representatives Oversight and Government Reform Committee have written to Secretary of State Hillary Clinton asking her to clarify reports that requests for more security - made in response to increasing attacks on Westerners in Libya - had been turned down. Representatives Darrell Issa and Jason Chaffetz said the committee would meet on 10 October to discuss the matter. Mr Issa set out details of a dozen attacks or threats against Western staff in Benghazi in the months leading up to the attack. Mrs Clinton did not address the specific concern in her response, saying: "I appreciate that you and your committee are deeply interested in finding out what happened leading up to and during the attacks in Benghazi, and are looking for ways to prevent it from happening again. I share that commitment." The state department is compiling a report overseen by retired diplomat Thomas Pickering. Key questions about the attack - what actually happened, whether it was a spontaneous assault or one planned to mark the anniversary of the 9/11 attacks in 2001, and who carried it out - remain unanswered. This has led to heated debate in the run-up to the election on 6 November. Republican Senator John McCain told CNN: "A first year cadet at West Point will tell you that that kind of attack is not a spontaneous demonstration." An FBI team sent to Libya to investigate has yet to visit the crime scene. However, US media have quoted senior US military and intelligence officials as saying that preparations are being made for possible military operations against those found to be implicated in the attack. One group named by Libyan officials as possible perpetrators is the Ansar al-Sharia Islamist organisation. President Barack Obama had vowed to track down the killers in the immediate aftermath. The New York Times said the Joint Special Operations Command was compiling a list of possible targets. It said the military options included drone strikes and Special Operations raids. However, it also said such actions would be strongly opposed by Libya, which has rejected any US military operations on its soil.